A Traverse City lumber worker’s house built circa-1890 endures, thanks to a sensitive 21st-century renovation. 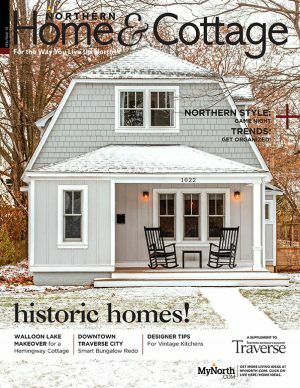 This home is featured in the February 2018 issue of Northern Home & Cottage. 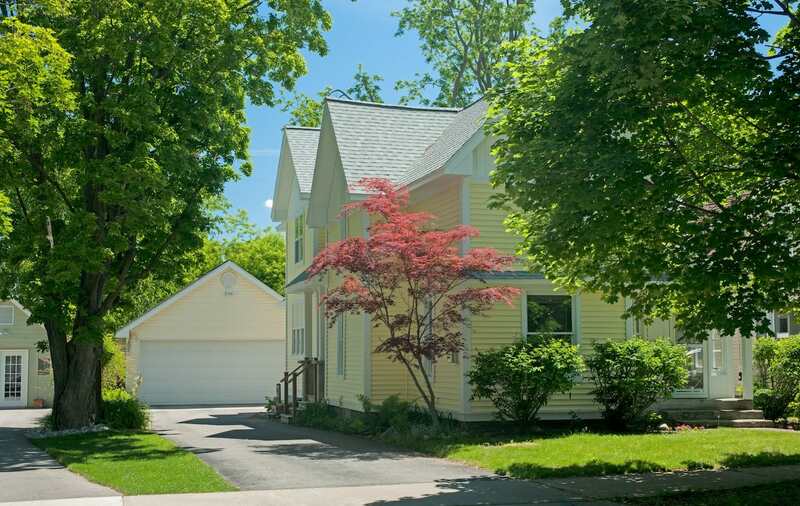 Despite its humble name, the Slabtown neighborhood located in the northwestern corner of Traverse City is one of the city’s most desirable, situated as it is a stone’s throw from West Bay, and at the gateway to beautiful Leelanau County. Slabtown is named for its modest homes built for lumber workers at the turn of the twentieth century and made from the material most readily available: wood scraps from the sawmills where they spent their days. Leafy streets are lined with colorful two-stories, bungalows and cottages that are both classically charming and notoriously slipshod. Common projects facing owners of the aging structures include foundation replacement, insulation, windows and mechanical upgrades. It’s enough to make a few opt for demolition and reconstruction. Eric and Shannon Olshove recognized the drawbacks after living for almost 20 years in their 1890s house on Monroe Street. Its leaky basement, winter chill, and awkward layout had them house-shopping a few years ago, but the pull of Slabtown’s charm and convenience was undeniable. Wishing to maintain the authenticity of the century-old home, they opted to renovate rather than rebuild. 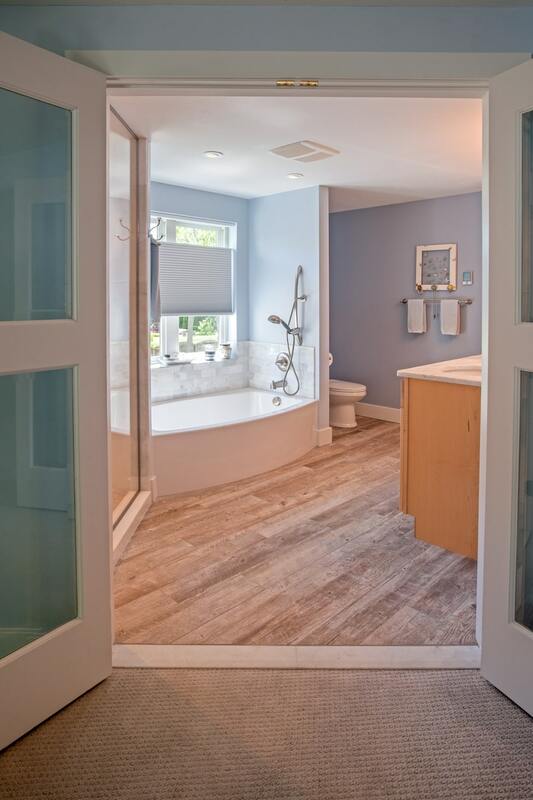 Their contractor, Scott Norris of Scott Norris Construction, warned them that remodeling could be more difficult and more expensive than rebuilding. The couple quickly approved a design by Caleb Norris of Norris Design Productions, but then decided to wait. “The timing didn’t seem right, and we wanted to make sure it was a smart investment,” says Eric. Then one winter day, Shannon declared that her only wish for Christmas was new hardware for the broken lazy Susan cabinet in the kitchen. Eric responded, “Well then, we might as well do the whole renovation.” Over the coming year they learned that with careful decisions, creative sourcing, and a lot of hands-on involvement, they could achieve much more than a smoothly turning corner cabinet. By removing a tacked-on 1950s addition and reconfiguring the back of the house, Norris and his team created a generous open kitchen and dining space that opens to a backyard deck. 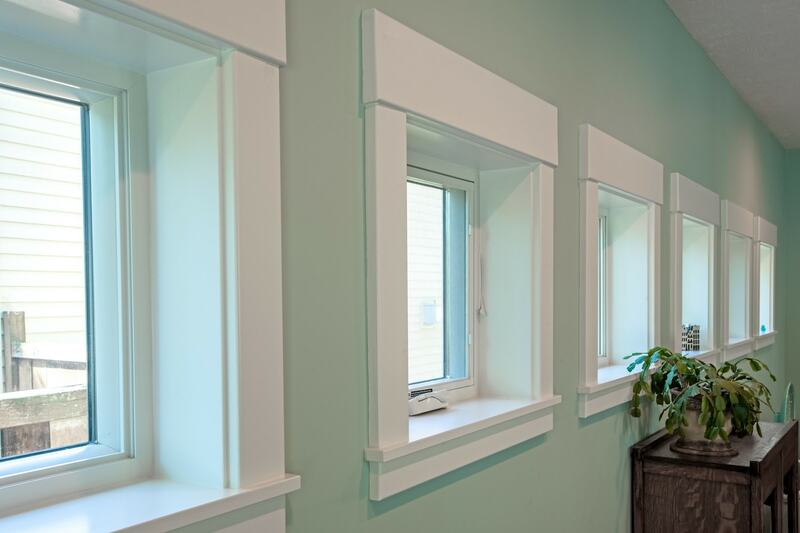 Eric was closely involved in the design process and requested three tall double-hung kitchen windows that fill the space with soft light even on a dreary day. 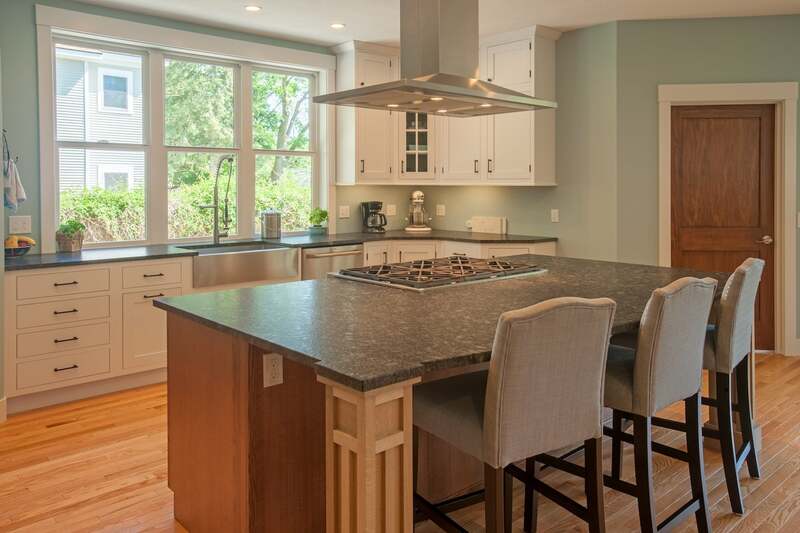 Shaker-style cabinetry and oak flooring maintain the classic look of the older section of the house, but a large pantry and upgraded appliances satisfy Shannon’s need for efficiency. A new mudroom stops clutter and dirt at the back door. Upstairs, Norris took care to include architectural features that would maintain the old-house feel: angled ceilings, classic doors and a staircase that splits at the landing. One side leads to the children’s rooms and the other to the couple’s tranquil master suite. Here Shannon explains how they found the cut-glass bathroom doors for sale on Washington Street and the hardware at Odom Reuse in Grawn. Including antique elements lent authenticity to the new wing of the house, and were easier on the budget. Norris acknowledges the challenge of working on an old house where nothing is plumb or level, but he used creative techniques to tie the new to the old and wrapped it all up in new buttery yellow siding and mint green shingles—a bold choice that Eric and Shannon made after noticing the color combo on a local brewery. “We like the variety of color you can see when you look down the streets here, and it has a sort of 1920s look,” says Eric. Thanks to owners with a respect for history and a contractor with the skills to complement it, the cheerful yellow house on Monroe lives for another century— in style.